Is there anything harder for young children than waiting for Christmas? At this time of year, as any parent or teacher knows, it’s hard to keep them focused on anything other than the anticipation of gifts and treats. And thanks to retailers and the endless commercial messages of Christmas. children are bombarded with options for expensive toys, electronics, and games. A friend once bemoaned to me, “His letter to Santa is three pages long!” Not exactly the spirit of the season! So how can parents help make December more peaceful, joyful, and Christ-centered? Fortunately, the church offers a beautiful and simple solution: Advent. Advent is a four-week liturgical season that begins the church year. 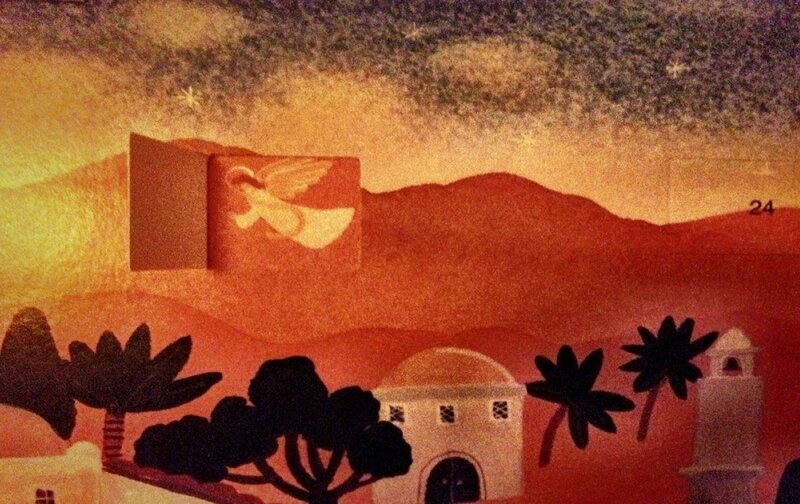 It is meant to be a time of preparing our hearts for the coming of Jesus (read Steve Leavitt’s excellent blog post on the traditions and meanings of Advent). If your December needs a de-stressing, celebrate Advent! You will not only enjoy the holidays more, you can also give your children a more spiritual grounding than the secular world allows. Let me share some thoughts based on more than 25 years of intentionally incorporating Advent into our family's life, and making Christmas a more joyful and peaceful time of the year. Use Advent as it was intended. Advent is a time of preparation, so slow down and take the entire month to get your home, your kitchen, and your heart ready for Jesus. Don’t think that you have to have everything “done” before you can start to celebrate Christmas. If you spread your preparations throughout the month, you can enjoy all of it more. Remember, if you get it all “done” by Christmas Eve, you are right on time! Limit the gift list. Help your children write letters to Santa early (we used to do it the weekend after Thanksgiving). Here is what worked for us: Baby Jesus got three gifts, so the children were only allowed to ask Santa for three things. The magic of this methodology is that they would think long and hard about what three things were special enough to make the cut but, once the letter was written and sent, they stopped thinking about what they wanted and would focus more on quality time with family and giving to others. Get an Advent calendar… but not one with a gift behind every number. There are some lovely children’s Advent calendars that build the nativity story one character at a time, with Baby Jesus being opened or added — at last! — on Christmas Eve. My now-adult daughter still hangs her childhood Advent calendar and adds a new piece to the manger scene every day! Get a nativity set. There are some unbreakable ones for kids, but don’t be afraid to have a nice one on display and to teach you children to treat it reverentially. On the first Sunday of Advent, we set up our empty stable with its lone cow at one end of the living room. The shepherds go up on a shelf nearby, Mary and Joseph are further away, and the Three Wise Men in a different room. Each Sunday, we move the figures closer to the stable. Mary and Joseph arrive on the fourth Sunday of Advent. On Christmas Eve the angel appears and, when we wake up Christmas morning, Baby Jesus is in the manger (the Wise Men don’t arrive until Epiphany). My kids are in their 20s now, but they still insist we do it this way! Help your children give to others. Picking out or making gifts for parents, siblings, grandparents, and close friends helps children shift from the “gimme season” to the “giving season.” Look for “Secret Santa” shops where children get assistance in buying and wrapping small token gifts; these are often associated with churches, schools, or charitable organizations. I will never forget how proud my son was, at eight years old, when he first bought Christmas presents for the family with his own money. Go to church on Christmas Eve. There is nothing like glorious Christmas hymns, bells, candles, and beautiful scripture readings to transition from Advent to Christmas! This year, the Church of the Transfiguration’s 4:00 p.m. mass on Christmas Eve will be a shorter family service with a “do it yourself” Christmas pageant. All children are encouraged to come to church dressed as an angel, shepherd, or animal, and join Father van Dooren on the steps of the chancel as he tells the ancient and beloved nativity story! Wishing you a blessed Advent! Katherine Hutt is a parishioner at the Church of the Transfiguration, the mother of two fabulous young adults, and a former director of children’s ministries for Church of the Holy Comforter in Vienna, VA.